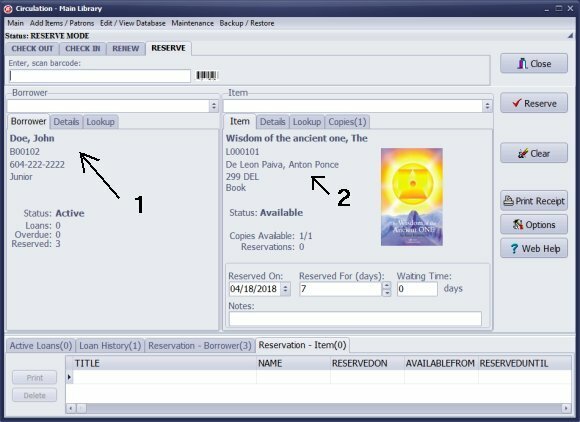 ﻿ Handy Library Manager, how to process library reservation. Help, how to topics > Reservations > How to process reservation? 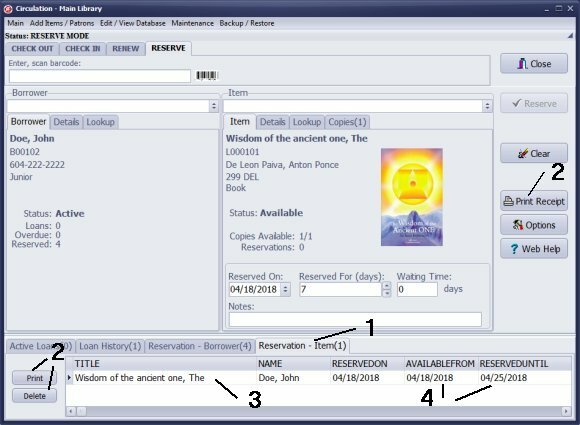 How to reserve the library item? You can process new reservation. You can add new reservation to the reservation queue. You can process future reservations (bookings). To open the Circulation transaction window in the reservation mode click Reserve in the Library Administrator panel. Scan or enter patron barcode number or select manually from the borrower selection box. Library member is selected (1). Scan or enter item barcode number or select manually from the library items selection box. Library item is selected (2). If you use barcode numbers remember to set your barcode processing mode. Use timer with the scanner, use Enter key with manual entry. Reserved On is set to today's date. You can change the value manually from the calendar. Reserved For defines for how long this reservation could be active. Reserved For is used to calculate Reserved Until. Click Reserve to finalize reservation. When the new reservation is processed it's added to the Reservation-Item (1) tab (and Reservation-Borrower tab). You can print reservation receipt or you can easily delete it (2). There is only one reservation for the selected item (3). This item is in the library, reservation is active, and all date values are assigned (4). The reservation will change status to old when today's date will be greater than Reserved Until. Reserved On is set to today's date value. You can change the value manually from the calendar. For future reservations (some libraries call it bookings) you enter the future date value (use calendar). Reserved For defines for how long this reservation could be active. Reserved For is used to calculate Reserved Until. For example, check in transaction is processed for the item that was reserved 2 days ago; this reservation will be activated; Available From value will be set to the return's date; Reserved Until will be set to Available From + Reserved For date value. If you define future reservation (booking); AvailableFrom and ReservedUntil will be set in the future. Future reservation should be processed by the librarian. Waiting Time informs librarian in how many days the item will be available for the borrower who wants to reserve the item (0 indicates item is in the library and is ready to be loaned, greater than 0 indicates that the item is loaned and/or there could be more reservations in the reservation queue). Reserved For is using the value that is set in Options/Loan Options. Question: I just have a few questions about the Handy Library Manager software. When reserving a book what does the wait time mean? Answer: For the item that is loaned out the wait time could be calculated in the following way: loan period + (number of reservations * loan period).